As the previous owner of coffee shop, I was a coffee glutton, drinking gallons of the stuff per day. I have recently cut back drastically on coffee, partially because of constant disappointment with the shoddy, bitter and over-roasted coffee and lame espresso shots being served at today's coffee shops and partially because tea is better for you than coffee. 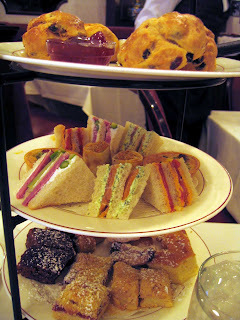 So with my newfound interest in tea, my goal is to experience all the afternoon tea service's in Chicago. 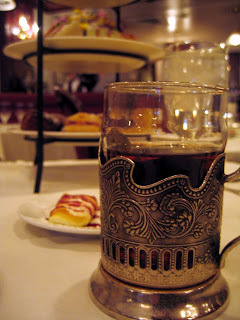 Our tea service adventure starts with the Russian Tea Room in downtown Chicago. The greatest part about the this tea service is that you can end your fabulous tea experience with a flight of flavored vodkas! Yea for Russia! For our tea, we choose the house Russian tea, a blend of Darjeeling, Ceylon and black currant. It was quite nice and served in a spiffy metal-glass mug. The three tiered service was loaded with scones, mini sandwiches (all quite tasty), mini quiches and an abundance of sweets. We couldn't finish the service between the two us, well worth the price. Then we moved onto the vodka flights. They have pre-set flights, or you can create your own. Dave started with the Molotov fight: honey pepper, pepper and horseradish vodkas. I created my own flight with coffee (go figure), horseradish and lime. We each tackled one more with Dave choosing coriander and I going with caraway. In true Russian manor, you are instructed to announce a toast ("to health' in Russian is suggested), smell the pumpernickel bread brought with shots, then shoot down the whole shot and follow with eating the pickle, neatly. It is also acceptable to sniff your shirt sleeve. All fantastic flavors - the lime being the most intense, caused me to pucker and shake my head numerous times until the flavor subsided in my throat. It was tempting not to order off the the regular menu. We saw plates of massive stuffed cabbage, Russian dumplings and the classic Ukranian Borscht passing by our table. This is a place that warrants a second visit. We drank, we ate and we were fat and happy!